Ocean Drive - Two is the follow up to Ocean Drive - One. 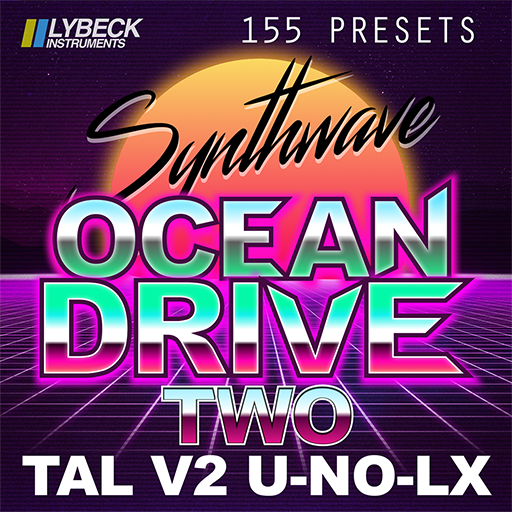 This pack contains 155 Synthwave presets in 8 Banks, Arp, Bells, Bass, FX, Keys, Leads, Pads, Plucks for TAL U-NO-LX. We have spent a lot of time to program these quality presets that will give your synthwave productions that extra touch. The main focus have been on creating that lush sound. These presets are really a work of art and we are very proud to finally release this pack. We hope you will enjoy using theses presets as much as we have been making them.